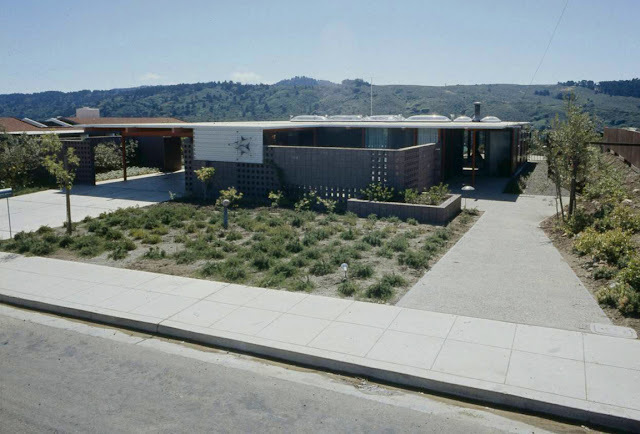 The X-100 "experimental research house" was built in 1956 as a promotional tool to help attract buyers to the San Mateo Highlands subdivision which was at the time a hard to reach location. 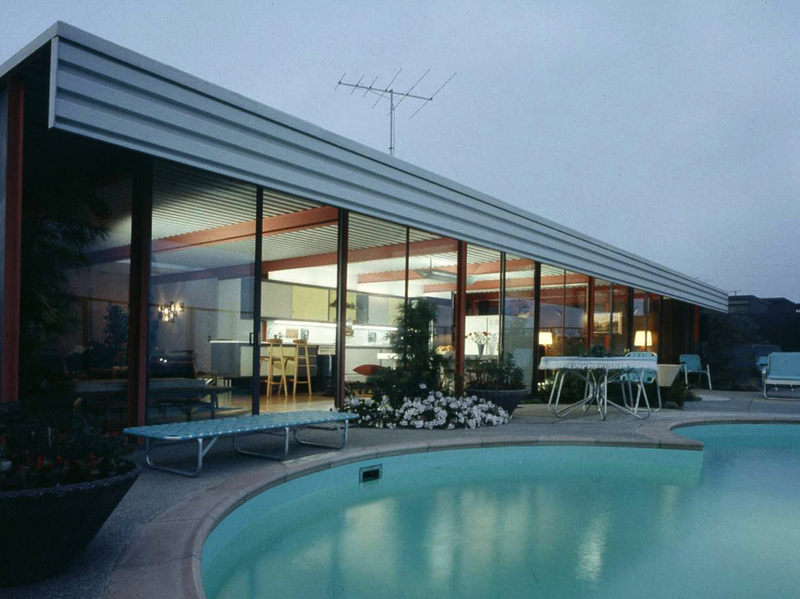 The steel post and beam home was designed in 1955 by architects A. Quincy Jones and Frederick E. Emmons for developer Joseph Eichler. 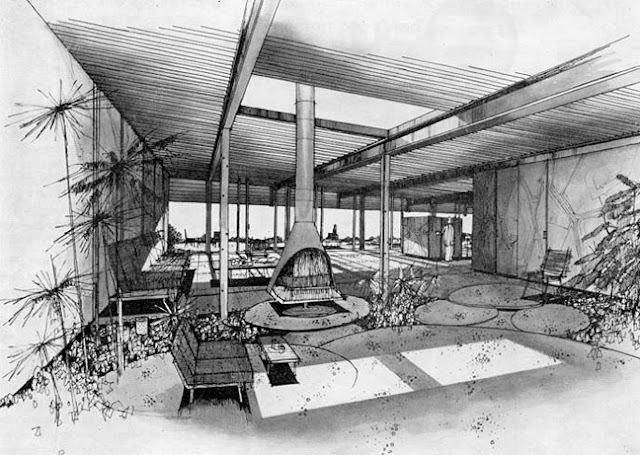 The "experiment" was a huge success, with articles in major magazines and newspapers touting it as the "home of tomorrow", the home eventually attracted over 150,000 visitors to the Highlands development. 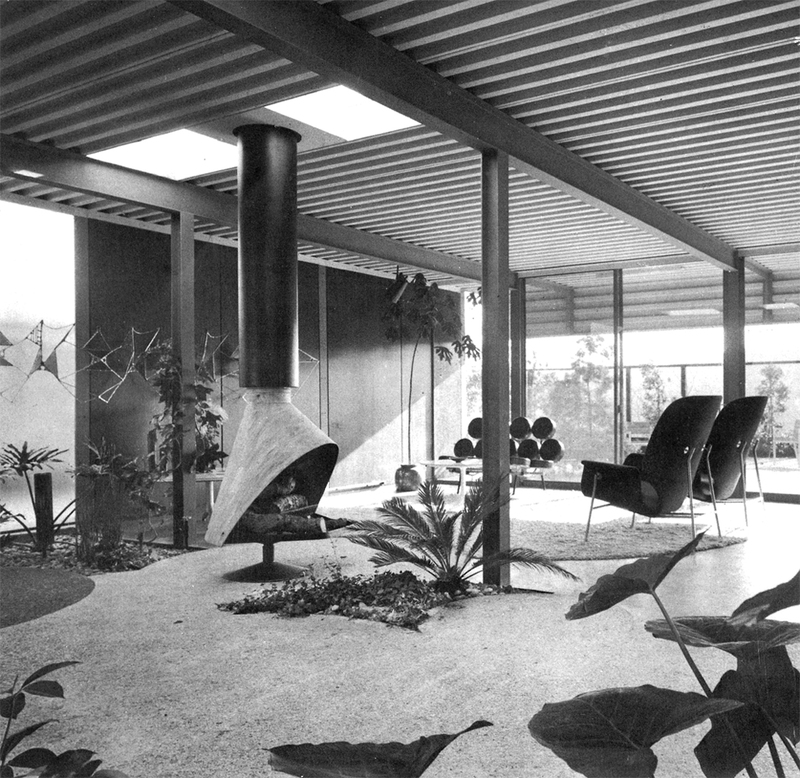 Note the indoor gardens, which were created from gaps in concrete that exposed the actual ground. Kitchen cabinet doors could be turned inside-out to change the color scheme. Centrally located fireplace that "revolves like a top to face any sitting area." A 32' long Wascolite Skydome skylight extended from above the fireplace across the core of the home. View towards master bedroom. 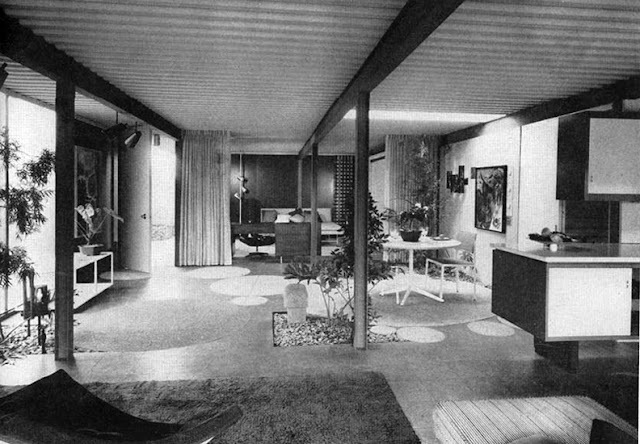 Note curtains act as an optional "fourth wall." 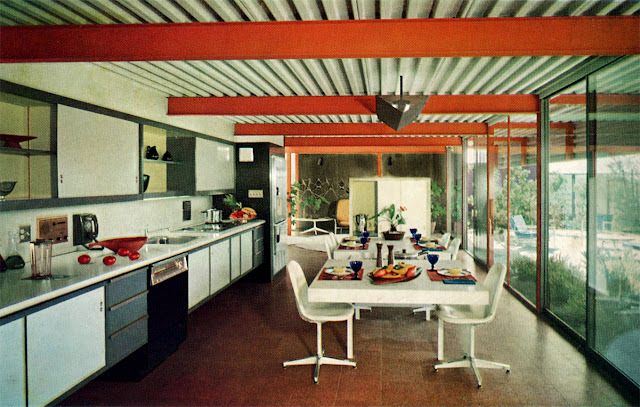 The exposed steel ceilings were light grey, contrasting beautifully with the cinnamon beams and posts. 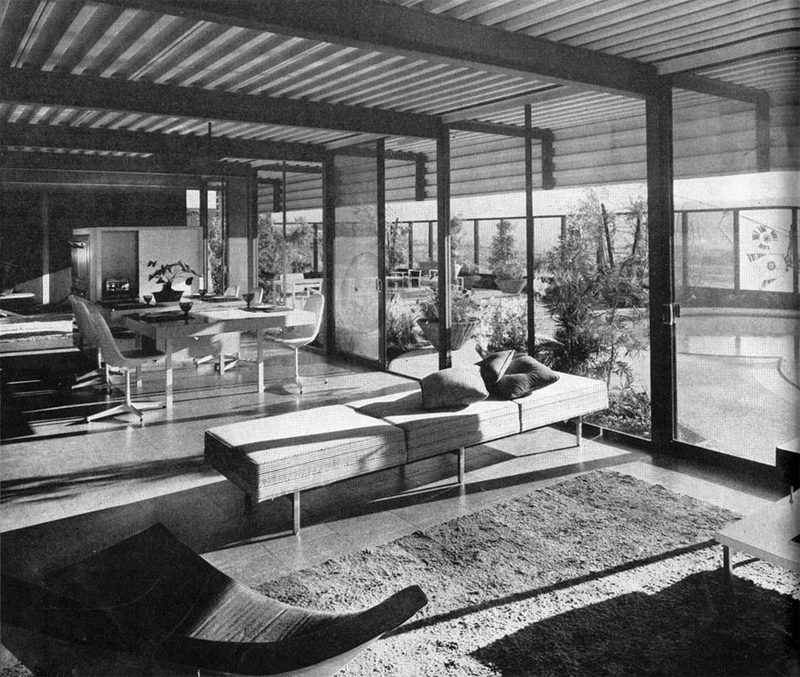 The entire 56' x 8' back wall was built from glass windows and sliding doors; bringing the outdoors in. 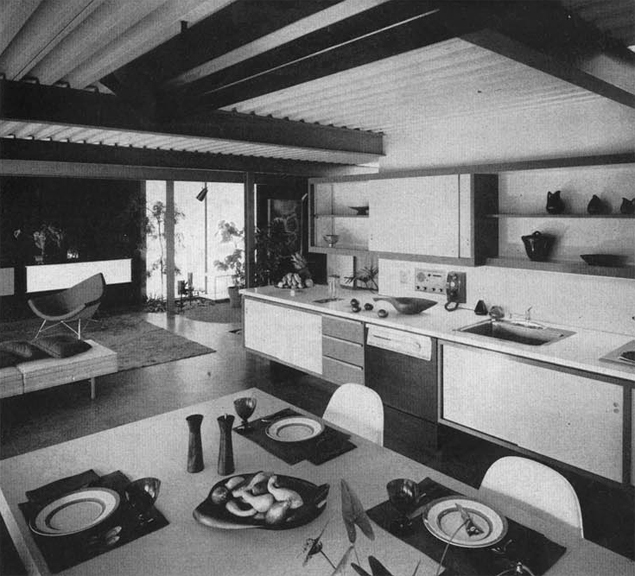 Dining table with built-in Thermador stove concealed under sliding table top. Huh? The kitchen was equipped with built-in Nutone blender and MusiCall intercom radio. The X-100 was featured in the Feb. 1957 issue of "Living for Young Homemakers" (link to full article below). Exterior street view of the X-100, c. 1956. 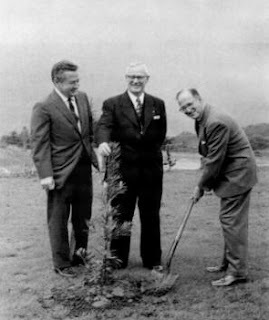 Image via Life photo archives. X-100 outdoor furniture was created by Van Keppel-Green. 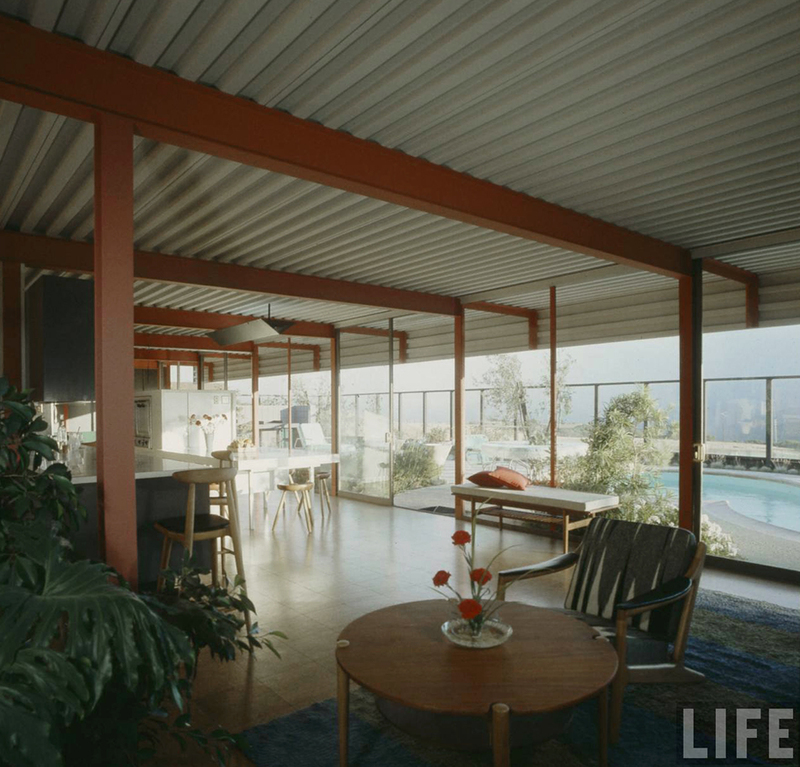 Image via Life photo archives. 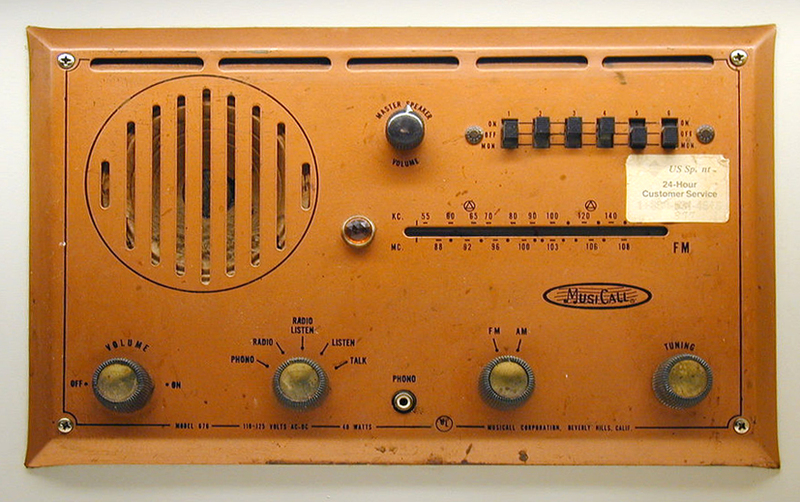 X-100 commercial, 1956. "Everything so modern it takes your breath away and your money too!" For email and RSS subscribers, if you don't see the video above click here. 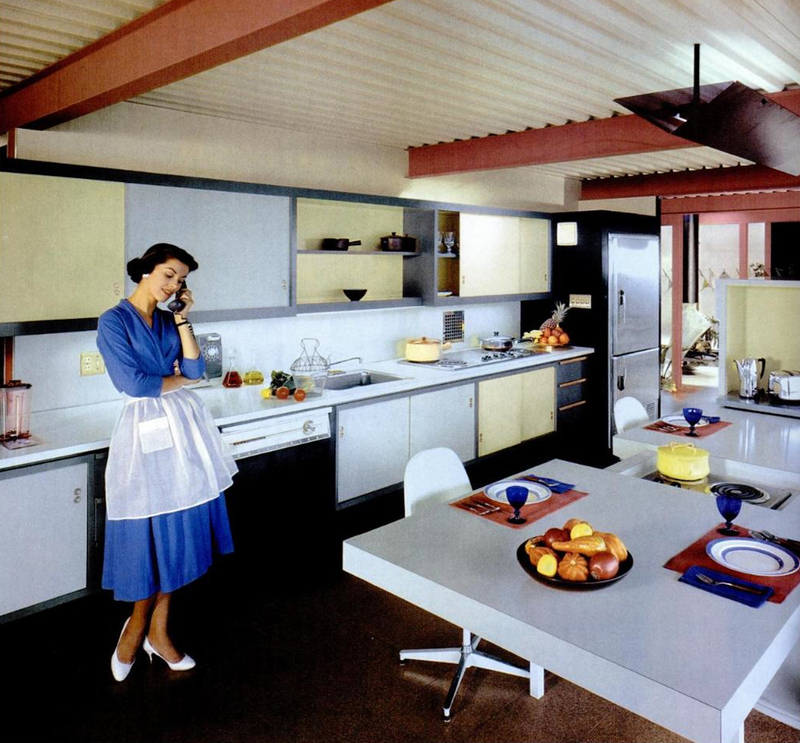 • Quote from grand opening brochure; "An exciting exploration into future living!... 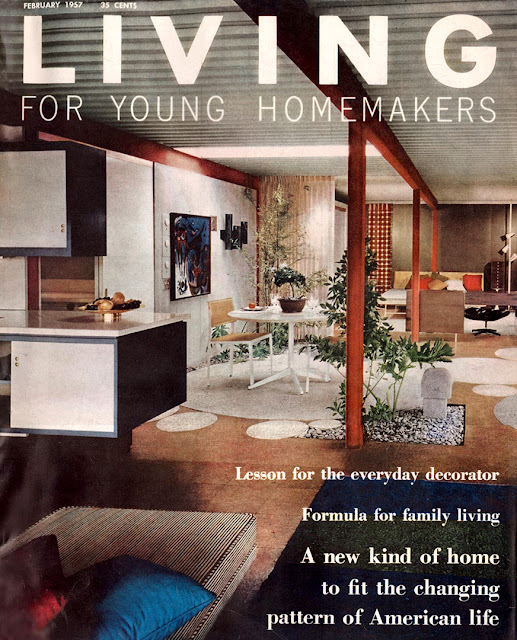 Eichler homes delve into the future with a new living form that serves as a research laboratory for testing new design concepts." 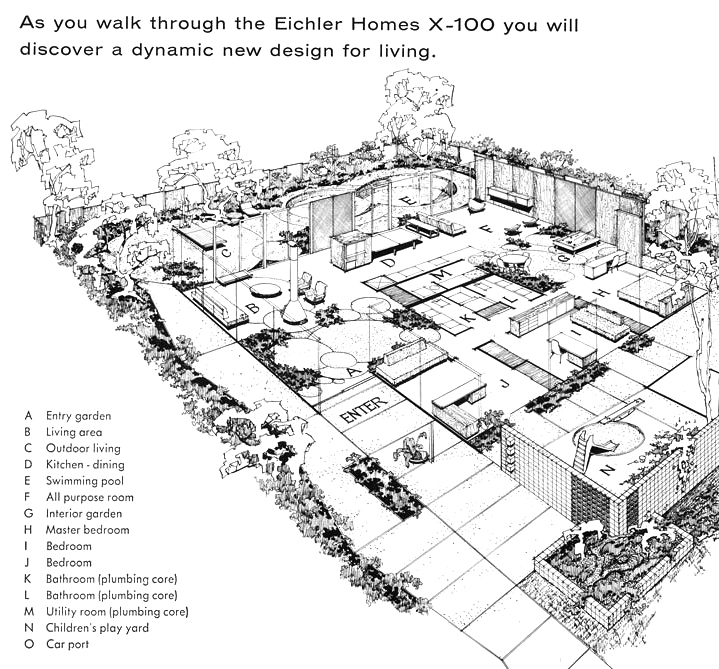 • The X-100 also acted as a product showcase; in the words of Ned Eichler (Joseph's son), "I thought we could get all those manufacturers who were hanging around our business trying to get us to use their products...a place to try out their advanced prototypes that weren't in production yet." 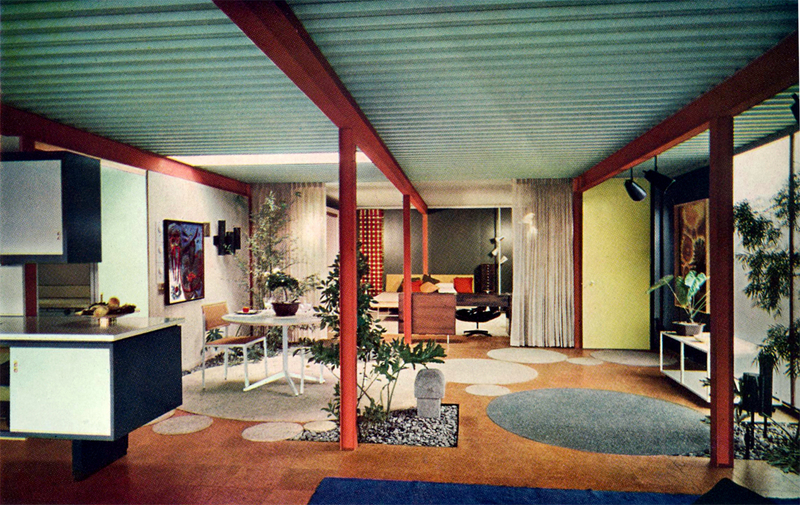 • A 1956 "Arts and Architecture" article stated, "One of the reason for Eichler building the home is because he thought organic building materials would be in short supply 'because we can't grow them fast enough.'" • The home was purchased for $775,000 in 2003 by Adrienne Biendo, John Ang and Marty Arbunich who have sinced restored the X-100. It has been nominated for designation to the National Register of Historic Places. Go to- Eichler Network article about the home titled "Discover Eichler's San Mateo 'X-100' House of Steel"
Images above are via; flickr, World of Eichler Design and Life Image Archives.